When the Canon 7D came out in 2009, it soon became one of the most popular DSLRs ever. It was fast, rugged, with great video features, all for a whole lot cheaper than the more pro-oriented 5D Mark II. Five years later, the 7D Mark II makes its debut with plenty of powerful specs, yet it's not likely to be the same wide-reaching hit as the original. The 7D Mark II, which costs $1,800 for just the body or $2,149 with an 18-135mm kit lens, is a high performance camera. Its 20.2 megapixel APS-C size sensor is relatively humble in resolution, but the sheer computing power that drives it is staggering. It has many of the same guts as the uber-souped up $6,800 Canon 1DX. That's some impressive tech to squeeze into a device meant largely for advanced amateurs. This power is mainly used to drive the camera's two main selling points—autofocus performance and burst speed. It's tailor-made for shooting fast moving subjects like sporting events or wildlife. That's the niche Canon is chasing. Please note that the unit we tested was a pre-production sample. After speaking with Canon, we are confident that the production units will be almost identical, but keep in mind that there could be tweaks in the version that is available for purchase. 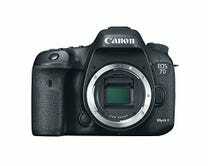 On the outside, the 7D Mark II is just another Canon DSLR. If you remove the camera's little "EOS 7D" badge, good luck identifying it in a lineup. Not much on the exterior has been altered except for some button positioning tweaks and a new lever for shuffling between focus modes. It's a stubborn approach that defies the current hunger for newness in gadgets, but it does show confidence in the camera's tried and true form. If you're a longtime Canon user, you'll be in familiar territory. If you're new to DSLRs: relax and get comfortable with one of the most sensible control layouts in the camera world. The 7D Mark II's magnesium alloy exterior is built tough as nails to withstand rain, wind, dust, and other inclement weather. 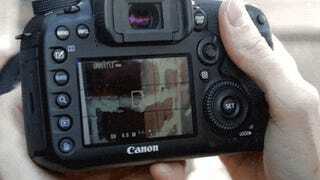 In fact, Canon states that it's four times as weather-resistant as the original 7D. As long as you have an equally rugged lens attached, it should be able to withstand everything you throw at it. I took it out in the rain a few times with no problems, but I'm sure I didn't test the limits of its durability. The tough exterior isn't without tradeoffs though. Many have hoped for a long while that Canon would introduce new exterior features like a swiveling display or touch-screen, both of which appear on lower end models like the 70D. These are perfect examples of features that add utility, but the general assumption is that they can't be implemented without compromising the camera's weather-resistance. That is the best explanation for why they have historically been limited to Canon's lower end cameras. In any case, what you have with the 7D Mark II is the iconic black brick that is a DSLR. And a brick may not be good enough any more. I've been toting around a Sony a7 for the past year, and carrying the 7D for my review process honestly felt like a burden. The thing weighs almost two pounds without a lens, which immediately makes it something I don't want to carry unless I absolutely have to. But DSLR owners generally know what they're in for, so the weight of the 7D Mark II won't necessarily be a surprise. If you're shooting a lot of fast moving subjects, the 7D Mark II might be the perfect tool. Tracking something that moves is one of the hardest things for camera hardware to do, and it's what accounts for much of the expense of the highest end camera bodies. The 7D Mark II brings some of the best autofocus tech within reach of many not looking to spend a fortune. Its 65-point autofocus system is among the best in the biz, backed by dual Digic6+ processors that let you fire off a blistering 10 frames per second. I just love the sweet sound of a shutter firing at that speed. In JPG mode it will gather over 100 shots before needing to buffer, and in RAW mode, 31 shots. That is some serious heavy lifting. By comparison, the top-of-the-line Canon 1DX shoots 14 fps, and the Nikon D4s 11 fps. There are mirrorless cameras that boast similar speeds, but they can't do it with nearly the same focusing abilities, which is, again, what makes the 7D Mark II so fierce. While my compatriot Bob Sorokanich was testing a gyro-stabilized unicycle, I used the 7D II to track him around our rooftop deck. There were a couple of shots with less-than perfect focus, but for the most part it did an impressive job tracking ol' Bob-o. I also ran a few tests comparing the 7D Mark II's tracking to the cheaper 70D. I didn't see a huge difference in actual tracking speed, but the 7D's broader expanse of focus points meant that as my subjects reached the edges of the frame, the camera did a better job of keeping them in focus. In the first row of images below you can see how as I panned across the scene, the green plant stayed in focus from edge to edge. In the next series, taken by the 70D, the plant drifted out of focus because there aren't focus points hitting it toward those outer areas of the frame. Autofocus of such power calls for a high level of customization in just how the camera tracks movement. Things like tracking sensitivity, which AF points are enabled, how they are displayed and selected—there are tons of ways to tweak the way the system behaves, and it's all present in a menu system exactly like the 5D Mark III. It is intimidating, with five pages of menu items just for AF, but Canon does a great job of making them clear and readable, with explanations for each item. There is a ton of customization in general, from setting a specific range of shutter speeds and ISO, to assigning your own functions to each button. It really is a tinkerer's dream. Canon started the DSLR video revolution in 2007 with the 5D Mark II. Since then, there has been a history of videographers requesting additional video-centric features, and companies refusing to deliver. The original 7D pleased video shooters with things like a dedicated video mode switch and 24p recording. At the time, this made it a darling in the growing DSLR video community. Five years later, video shooters are a much more needy bunch, and technology has come a long way. With Panasonic delivering hassle-free 4K in their GH4, and Sony creating the small and light a7s that shoots stellar HD video, the bar has been raised. Unfortunately, the 7D Mark II just doesn't push the bar forward when it comes to video. The image quality is roughly the same as the 5D Mark III, a camera over two years old, with a softness that some consider to be quite dated. It features Dual Pixel AF, which allows for fairly good autofocus during video shooting, but that isn't enough to lure video shooters back to Canon. The users who fell in love early on with video shooting on Canon DSLRs hoped and prayed that things like focus peaking, zebra patterns, or maybe a new higher bit-rate codec would appear in future models. None of this is present on the 7D Mark II. In a sense it's unreasonable to expect these features in a camera that is so clearly for sports and wildlife still photography. But it's still frustrating because video-friendly features are basically nowhere to be found anywhere in Canon's lineup, until you arrive at their Cinema EOS models, which are too expensive for most pockets. Even Nikon has addressed many video shooters' requests with the D750's clean quality and articulating display. Sadly, Canon DSLR video is at risk of becoming a relic of the past. Besides the large lens ecosystem, I don't see a reason to buy a Canon DSLRs for video these days. Image quality on the still side is good, but you probably won't notice any major difference from any other current generation APS-C sensor. Staggering image quality is not a reason to buy this camera. But we can't hold that against it because image quality across the spectrum of cameras has leveled off in the last couple of years. Still, it was a surprise when comparing RAW files at ISO 100 between the 7D Mark II and the 70D with the same lens and settings, I found the 70D to be a hair sharper. For full res images, visit our Flickr gallery. At last, a timelapse intervalometer is built in to the 7D Mark II, so you don't have to ludicrously purchase a separate accessory. You can choose to either capture the first 100 frames or pick unlimited, which I assume will go until your card is full. The de-flicker option is super useful for preventing the sharp jumps in exposure that happen when recording timelapses with auto-exposure. One thing I really enjoyed about the 7D Mark II is actually mostly intended for video, but is useful for shooting stills in Live View—the Dual Pixel AF system. In olden times, shooting in live-view, where you are monitoring exposure on the LCD instead of looking through the viewfinder, was hampered by near-useless focusing speeds. Now, focusing in live-view is nice and speedy, and makes using the LCD to shoot much more enjoyable. This is is a perk shared with the 70D, though, so it's not altogether new. In essence, the 7D Mark II is one of the best, most capable APS-C DSLRs you can find. A few years ago, a statement like that would mean that everyone with $2000 for a camera would be well-advised to go buy it. But the world has changed. There are suddenly a whole variety of high-end cameras to choose from, from the retro rangefinder-style Fujifilm X series, to the Sony full-frame a7 series. The people who really need DSLRs are those in need of blistering speed, which comes at the expense of convenience, comfort, and innovative features. It is interesting to see Canon playing exclusively for the sports and wildlife crowd with the 7D Mark II, and not really chasing any other group of photographers. If you are a travel or street photographer, I would say go with something much lighter and easier to transport with 2 or 3 lenses. If you are going for super high res files over 24 megapixels, there's nothing for you in Canon's lineup. And if you are a video shooter, there is a growing list of better options in terms of image quality and usability. The 7D Mark II is an incredible camera for a few very specific tasks. It has the most powerful guts of any APS-C DSLR to-date. Focusing is fast as hell in pretty much any condition, especially tracking moving subjects. Low light performance is one small step above other APS-C cameras. You'll be able to shoot in any condition thanks to the robust weather-sealing. The camera is superbly customizable. Autofocus in video mode is great and makes shooting stills with live-view much easier. It's super-duper rugged. It's still a large and heavy DSLR that is a pain to carry around. Video quality is improved from previous APS-C bodies, but it's still not an improvement over the two year old 5D Mark III and can't compete with the latest mirrorless cameras. It also lacks basic video features like focus peaking. Still image quality is largely stagnant from previous generations of Canon DSLRs. If you shoot athletes or animals and are trying to keep it under $2000 for a new body, I would wholeheartedly recommend the 7D Mark II. Besides the increase in low light performance and an obsession with the full-frame "look," there aren't many reasons to go all-in on a 5D Mark III which is almost double the price. The 7D Mark II shoots faster and focuses better. You're getting near the performance of the cameras NFL photographers use without having to spend seven grand on a body. If $2000 is still a tough ask, there are no shortage of cheaper options. On the Canon side, the 70D is very capable. It's got slightly less low-light acumen, worse video quality, and a less rugged body. But if you don't need cutting edge focusing and 10 fps bursts, it will do you just fine for $1000 body-only. The Nikon D5300 is also good, with solid video quality to boot. For the thousands of photographers who don't focus on fast moving subjects, who primarily shoot travel, lifestyle, landscape, or video—I just can't see the advantages of the 7D Mark II (or any DSLR) outweighing the inconvenience of this heavy brick. Look, a lot of people are madly in love with DSLRs, and they will be quick to point out that you just can't get the reliable autofocus or the clarity of an optical viewfinder in a mirrorless camera. Fair enough. But those aren't universal ideals in world where pro quality cameras exist that you can fit in your coat pocket. Size and weight matter enormously. With these heavy DSLRs, more people are second-guessing whether they actually need the heft that sports photographers require. Very often they don't, and will promptly look away from DSLRs. But hey, if we are simply judging the 7D Mark II in its own context of semi-pro DSLRs, it's a fantastic performer. If that's your niche, you won't be disappointed.